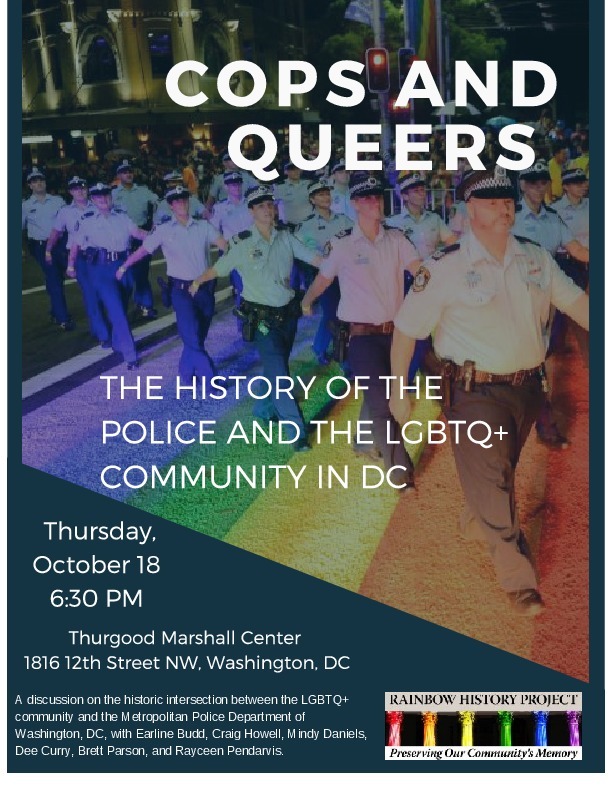 On October 18th, Rayceen Pendarvis will moderate an historical discussion with Earline Budd, Craig Howell, Mindy Daniels, Dee Curry, and Brett Parson on the intersection between the LGBTQ+ community and the Metropolitan Police Department of Washington, DC. <a href="/items/browse?advanced%5B0%5D%5Belement_id%5D=47&advanced%5B0%5D%5Btype%5D=is+exactly&advanced%5B0%5D%5Bterms%5D=Reproduction+and+use+of+this+material+requires+permission+from+the+copyright+holder.+Please+contact+the+Rainbow+History+Project+for+more+information.%0D%0A">Reproduction and use of this material requires permission from the copyright holder. Please contact the Rainbow History Project for more information. <a href="/items/browse?advanced%5B0%5D%5Belement_id%5D=39&advanced%5B0%5D%5Btype%5D=is+exactly&advanced%5B0%5D%5Bterms%5D=Rainbow+History+Project">Rainbow History Project</a>, “"Cops and Queers: The History of the Police and the LGBTQ+ Community in Washington, DC" Panel Discussion,” Rainbow History Project Digital Collections, accessed April 23, 2019, https://archives.rainbowhistory.org/items/show/1639.